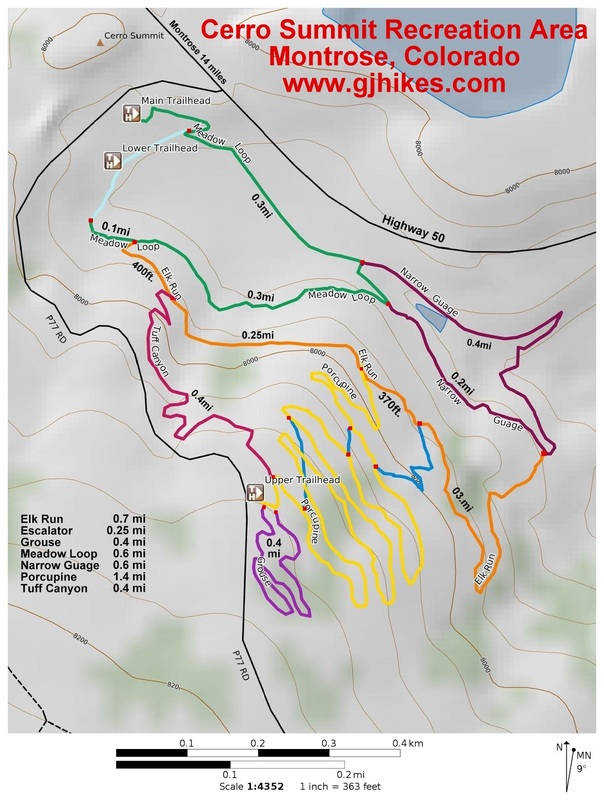 The Escalator trail is located in the Cerro Summit Recreation Area near Montrose, Colorado. The lower end of the trail begins off of the Elk Run trail where it zigzags up the side of the hill crisscrossing the Porcupine trail along the way. The trail ends near the top of the hill where it makes one final encounter with the Porcupine trail. Unlike the mechanical escalator at the mall that is either up or down this one works just fine in either direction. The Escalator trail begins at the 0.4 mile point of the Elk Run trail. For most of its distance the Escalator trail is well secluded within the thick oakbrush that covers the side of the mountain. At times it will briefly enter a small clearing before disappearing once more into the brush. At the Escalators first contact with the Porcupine trail it turns and shares routes with it for just over 200 feet before branching off on its own again. Currently all the intersections are well marked which makes route finding an easy task. Scattered within the oakbrush there are a few serviceberry bushes. In early summer blossoms can be a treat to the eyes while later in the summer the berries make a nice trail snack. Pin Cherries are another fruitful surprise along the Escalator trail. All total the Escalator trail has 6 encounters with the Porcupine trail as it winds its way up the mountainside. Near the top of the hill in a clearing there is an Earthscope monitoring station. The geophysical instrumentation at the site provides GPS information for tracking and studying the movement of the earth's crust as part of a larger network that covers the entire country. Escalator comes to an end at its last encounter with the Porcupine trail which is about 500 feet from the upper trailhead. When we were here taking the photos for this post we came up the Escalator trail, then went around the Grouse trail, and finished up by going down Porcupine. 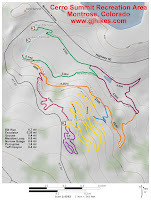 None of the Cerro Summit trails are all that long by themselves but you can chain them together to come up with whatever length outing meets your needs. Besides hiking and mountain biking the Cerro Summit trails are also a good destination for snowshoeing and cross country skiing during the winter months. With a trailhead that is right next to the highway they are easy to get to year round. If you would like to see it for yourself then all you have to do is 'Take a hike'.